Some of central Wisconsin’s finest craft breweries, distilleries and wineries are joining forces to encourage visitors to sip their way through the Stevens Point area. Five local businesses have collaborated to create the Central Wisconsin Craft Collective, an organization that highlights the unique flavor that the four craft breweries – as well as a winery and newly opened distillery – bring to the Stevens Point area. The Central Wisconsin Craft Collective consists of Central Waters Brewing Company in Amherst; Plover’s Great Northern Distilling, which had its grand opening earlier this year; Kozy Yak Brewery/Fresar Winery in Rosholt; O’so Brewing Company in Plover; and the historic Stevens Point Brewery. And, to help spread the word about the Central Wisconsin Craft Collective, the group has launched the Craft Collective Sweepstakes, a promotion that will award one lucky winner with a trip for four to the Stevens Point area for tours and tastings at the Craft Collective locations, as well as other prizes. Visitors to the Stevens Point area will find a distinct flavor to each of the members of the Central Wisconsin Craft Collective, which are spread throughout Portage County. Stevens Point Brewery, Stevens Point. Established in 1857, Point Brewery is the fourth-oldest continually operating brewery in the country and still continues to expand, having completed four expansions since 2010. Central Waters Brewing Company, Amherst. Central Waters takes its commitment to the environment seriously, boasting locally sourced materials for brewing, bottling and packaging, as well as two large solar arrays. O’so Brewing Company, Plover. This so-called “freestyle brewing” company is celebrating its seventh year of operation in November. Its proud Wisconsin roots are on display at the brewery’s tap room, where you can find 40 beers on tap from across the state. Kozy Yak Brewery & Fresar Winery, Rosholt. The newest addition to the area’s brewery scene, Kozy Yak has been serving ales, stouts and lagers since 2012. Kozy Yak’s owners planted their first vineyard in 2003, and visitors can now reap the rewards through Fresar Winery. Great Northern Distilling, Plover. Opened in 2014, Great Northern Distilling creates small-batch spirits using ingredients from within 150 miles of the distillery. Don’t miss the distillery’s Mixology Lounge, where you can sample drinks made with Great Northern’s potato vodka. The Craft Collective Sweepstakes, which runs through Nov. 21, will give visitors a chance to experience the tastes of the new Central Wisconsin Craft Collective firsthand. One grand-prize winner will receive two nights’ lodging for up to four people, as well as tours and tastings at each of the stops on the Craft Collective, transportation all weekend long, dining gift certificates, and a goodie bag filled with merchandise from each Craft Collective member. 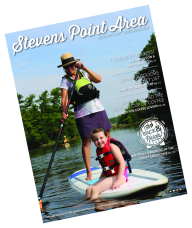 For more information on the Stevens Point area, visit www.stevenspointarea.com. You can also find the Stevens Point Area Convention & Visitors Bureau on Facebook, Twitter and Pinterest.